In the overview editor, you can scroll through the basic information regarding your experiment. In this mode, you can see and define which files are presented to subjects in your different experimental conditions, and the order in which they're to occur. Double-click on any condition or position field, and the file details will be displayed for the file at that location. Double-click on any file field, and you will be able to search your drives for the file you're looking to put there. If you want to edit the file name field without being prompted for a file, just highlight the cell and press enter to edit it. Allows you to save summary information and detailed notes regarding your experiment. The title and comments are for the Editor's reference only. The comments field has a very large capacity if you wish to exploit it. 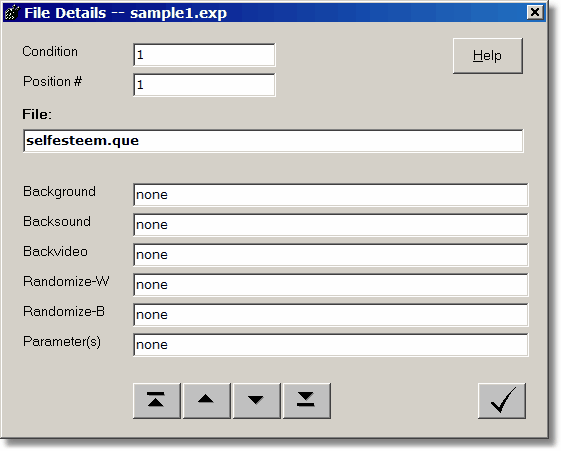 Allows you to set various options for the presentation of your experimental files. 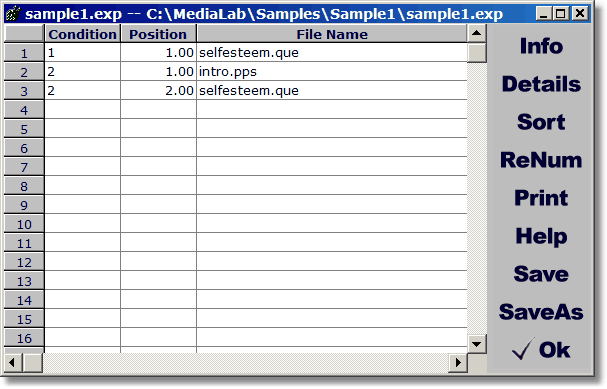 Sorts the files in the experiment, first by condition and then by position. The sort button makes life a little easier by automatically reordering all of the files in your experiment so that you need not worry about where you are placing a file at any given time. When MediaLab sorts the experiment files, it will first place all of the files in each condition together. Next, it will reorder the files within each condition by their ordinal position. If you forget to do this, the editor will do it automatically when you exit. You can manually sort whenever and as often as you like by clicking the sort button. To add a new file between two existing files (e.g., at positions 2 and 3), assign it a position value between these values (e.g., 2.5) and then click the Sort button. After sorting, you can automatically renumber all of your items as sequential integers by clicking the renumber button. Important: MediaLab will first sort by the condition field and then by the position field, so be sure that you identify the condition of the file before you sort. Renumbers the position values within each condition with sequential integer values. The renumber button cleans up your position numbering by replacing the values with sequential integers. Within each condition, the first file will get a position value of 1, the second will get a 2 and so forth. This is not a necessary operation and is provided mainly for the purpose of aesthetics and to help you verify that you have the correct number of files in each condition. If your files are out of order, be sure to sort before you renumber. Starts the interactive help system. You can search the documentation using the Contents, Index and Search tabs in the left-hand window. Also note that MediaLab takes advantage of context sensitive help such that pressing F1 at any time will often direct you immediately to help with what you are working on. A printable PDF copy is available in the C:\MediaLab\Help folder. Saves the current file while allowing you to set the file name and/or location. Closes the Details window and returns to the Overview window. •you can also use the Tab key and the arrow keys to jump from one field to the next. When your are editing in the overview window, double-clicking will allow you to edit any field or will pull open a file search box if a file is required. If you want to edit a field that requires a filename but do not want to open a file search dialog, then simply highlight the field and press enter to edit the field directly. All forms have a button with a check mark, like this: . This button closes whatever editor you are currently in. You will always be given the option to save any changes that you've made. •and the fourth key takes you to the last file in your experiment.